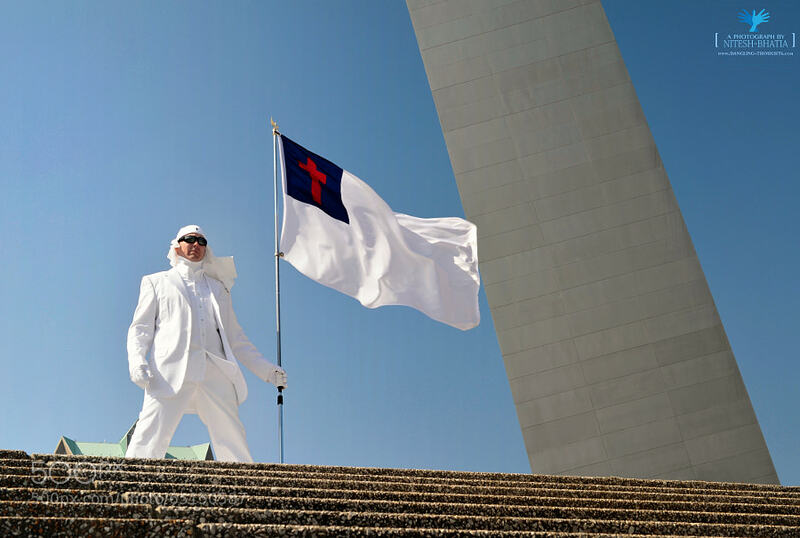 During my visit to Gateway Arch at St. Louis, I saw this man standing under the Arch in pure white clothing. It was super chilly wind during that time. But his posture was stiff, as if somebody from army is standing. 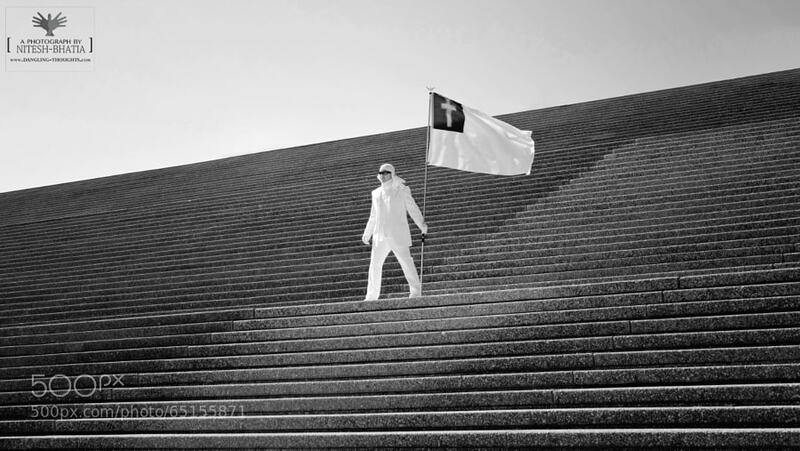 He was stiffly standing in this posture, motionless, holding white flag with red plus sign of christianity. Somebody asked him what was he doing there? Loudly, he said he is Brad, Servant of the Lord. The Lord had spoken to him and he would be there on earth and would come under this great monument along the mighty river Mississippi, on Sundays from 10 am to 4 pm. He is standing there to give this message to everyone. I came across several St. louis based bloggers who have reported about Brad. One of the blog tells about the actual story of Brad and the reason behind this act of standing. 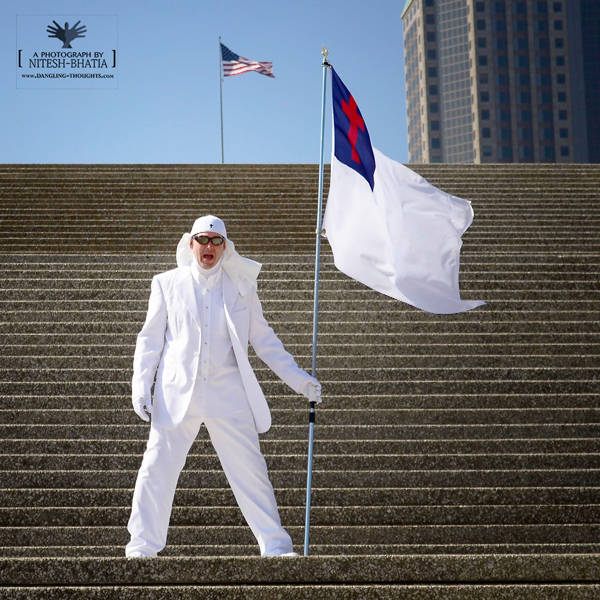 "A few years ago, Brad Lee was living a rebellious lifestyle and felt that nothing could touch him, but it didn't take long for life to shatter his facade of independence. A female friend, Sunshine, was diagnosed with cancer, and the doctors weren't sure she would survive. The news sent him into a tailspin. Broken down, he cried out desperately for God's help. Brad felt God drawing him toward repentance. Somehow God revealed that he was not a genie in a bottle. It would take commitment - a full turn from Brad's careless ways - for his prayers to have any weight. Relationship with God restored, Brad turned his attention and prayers to Sunshine. For him, those Bible references to healing weren't literary devices. They were promises that God hears his saints and responds when they ask for something in the name of Jesus.With the zeal of a radically new believer, he threw himself into fasting and prayer. In light of God's power, he would only accept a full recovery. Though given only three months to live, Sunshine's health began to dramatically improve. Eventually she was cured completely. Brad saw this not only as an answered prayer, but a new commission. He would pray for as many people as possible, hoping God might similarly change their fate. So now he stands stoically in the same spot every Sunday from noon to 3 p.m., three solid hours faithfully hoping and praying that God will lead an injured soul his way."